Cauldron Soups, doing business as Cauldron Broths, a Bellingham, Wash. establishment, is recalling approximately 5,163 pounds of beef broths that did not undergo federal inspection. There have been no confirmed reports of adverse reactions or illness due to consumption of these products. 24-fl. oz. 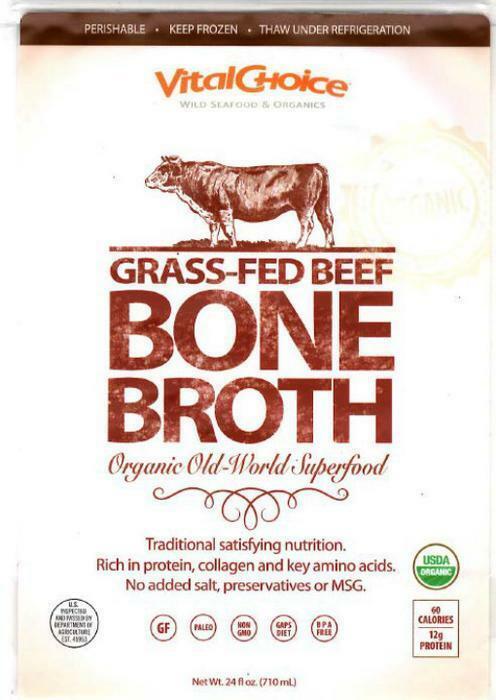 individual plastic pouches containing “Vital Choice GRASS-FED BEEF BONE BROTH” with best by dates 1/15/2018, 1/18/2018 and 3/28/2018. 24-fl. oz. individual plastic pouches containing “CAULDRON BROTHS BEEF BONE BROTH” with best by dates 1/3/18 and 2/15/18. 24-fl. oz. individual plastic pouches containing “CAULDRON BROTHS ORGANIC CAULDRON'S CURE” with best by dates 12/21/18. 1-gal. individual plastic containers containing “CAULDRON BROTHS GLACE DE VIANDE” with best by date 1/30/18. 8-fl. oz. individual plastic containers containing “CAULDRON BROTHS GLACE DE VIANDE” with best by date 3/4/18. The recalled products, bearing establishment number “EST. 45953” inside the USDA mark of inspection, were shipped to retail locations in Washington and to a distributor who conducts internet sales direct to consumers nationwide. Customers who have the recalled products should not consume them, but throw them away or return them to the place of purchase. Consumers with questions about the recall may contact Gabriel Claycamp at (360) 671-1098 or by email at customercare@cauldronbroths.com.